Introduction: Increasingly, laparoscopy assisted distal gastrectomy (LADG) is performed in patients with early gastric cancer. However, it has technically difficult procedures such as laparoscopic lymph node dissection or intracorporeal reconstruction. Accordingly, standardization of surgical procedure and establishment of training system is necessary for LAG to be more widely adopted as a standard treatment for gastric cancers. 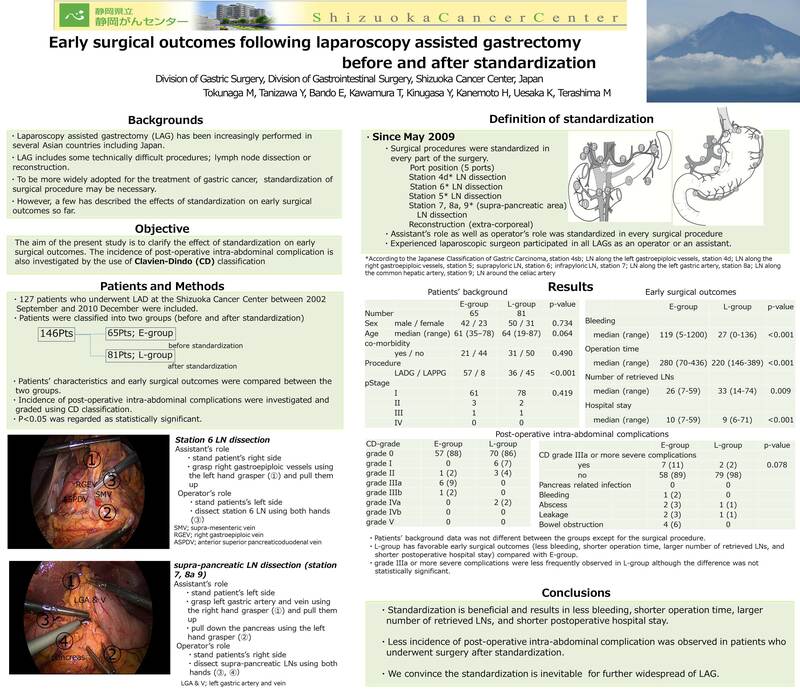 The aim of the present study is to clarify the value of standardization by comparing early surgical outcomes, including postoperative complications evaluated by the use of Clavien-Dindo (CD) classification before and after standardization. Patients and Methods: From September 2002 to April 2010, 123 patients underwent LADG at Shizuoka Cancer Center. Since May 2009, LADGs were performed or supervised by Board Certificated surgeons, and each surgical procedure was standardized. Early surgical outcomes were compared between patients who underwent LAG after May 2009 (L-group, n=58) and before April 2009 (E-group, n=65) to clarify the efficacy of standardization of our institute. Results: There were 79 male and 44 female patients with median age of 61 years. There was no significant difference in gender and age between groups. Median operation time was significantly shorter in L-group than E-group (212 vs 280 minutes, P < 0.001), and estimated intraoperative blood loss was also small in L-group than in E-group (26.5 vs 120 ml, P < 0.001). The number of retrieved lymph node was also significantly different between groups (33 vs 26, P = 0.012). CD classification grade II or more complications were observed in 4 of 56 patients in L-group (7 %) and 8 of 65 patients in E-group (12 %, P = 0.380). CD classification grade IIIa (require intervention not under general anesthesia) or more complications were less frequently observed in L group (2 patients; 4%) than in E group (7 patients; 11%) although the difference was not statistically significant (P=0.174). Postoperative mortality was not observed in any patients in the present study. Conclusion: L-group has a shorter operation time, reduced blood loss, and more accurate lymph node dissection. Moreover, postoperative complications also decreased after standardization though the difference was not statistically significant; thus we convinced that the standardization of each surgical procedure is beneficial for improving early surgical outcomes and inevitable for future widespread use of LADG.